The Battle of Breitenfeld (German: Schlacht bei Breitenfeld; Swedish: Slaget vid Breitenfeld) or First Battle of Breitenfeld (sometimes First Breitenfeld) , was fought at the crossroads villages of Breitenfeld, Podelwitz, and Seehausen, approximately five miles northwest of the walled city of Leipzig September 7 (old style or pre-acceptance of the Gregorian calendar in the Protestant region) September 17 (new style, or Gregorian dating), 1631. Breitenfeld represented the Protestants’ first major victory of the Thirty Years War. The Protestant victory ensured that the German states would not be forcibly reconverted to Roman Catholicism. 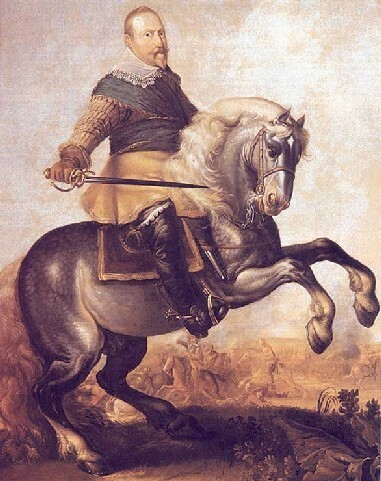 The victory further confirmed Sweden’s Gustavus Adolphus of the House of Vasa as a great tactical leader and induced many Protestant German states to ally themselves with Sweden against the German Catholic League, led by Maximilian I, Elector of Bavaria, and the Holy Roman Emperor Ferdinand II of Austria. The armies drew up on a plain near the village of Breitenfeld, a few miles outside the walls of Leipzig. At first, von Pappenheim’s reckless gamble seemed about to pay off: at the first charge of his cavalry, the raw Saxon levies broke and fled the field. However, Gustavus nimbly turned his line to prevent the ponderous battalia of the Imperial forces flanking him. A daring Swedish cavalry raid captured all of the Imperial artillery, which was turned against its owners. Artillery pounded the Imperial phalanxes until night fell. The Imperial armies were utterly destroyed. They lost two-thirds of their men and all their artillery and supplies. The remnants fled: von Pappenheim took refuge in Westphalia behind the line of the Weser while Tilly fell back on the Upper Palatinate. In a stroke, Gustavus had made himself master of Germany.